With the increased introduction of smaller, more affordable CNC routers, even home shop woodworkers are getting into the act, and these 5 bits make an ideal set to get you started. From carvings, to sign making, and more, this set is designed to rout every detail to perfection. All bits 1/4" shank. Whiteside Machine Company - Claremont, North Carolina. #SC66 Conical 1/16" Taper Bit- 4 fluted spiral with a 1/8" diameter ball nose (1/16" radius), a 7.2 degree included taper (3.6 per side), and an overall length of 2-1/2". 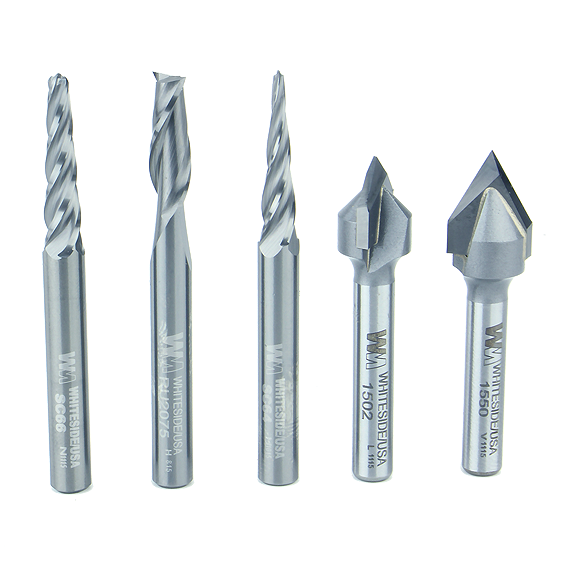 #SC64 Conical 1/32" Taper Bit- 4 fluted spiral with a 1/16" diameter ball nose (1/32" radius), an 11 degree included taper (5.5 per side), and an overall length of 2-1/2". 1/4" shank. #RU2075 1/4"Spiral Upcut Bit- This 2 flute spiral upcut bit has a 1/4" diameter with a 3/4" cut length, and an overall length of 2-1/2". #1502 90 Degree Vee Groove Bit- Has a 1/2" cutting diameter, and a 1/4" point length, with an overall length of 1-7/8". #1550 60 Degree Vee Groove Bit- Has a 1/2" cutting diameter, and a 7/16" point length, with an overall length of 2".